Well, he turned me down for a personal interview (WTF?!) 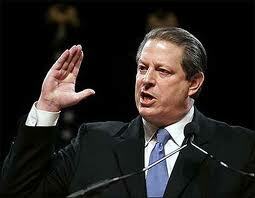 but I still managed to catch most of Al Gore’s speech at the 2010 Millenium Summit in Montreal. This presentation was not recorded or broadcast publicly so it is an earthgauge exclusive. You heard it here first! In his speech, the former VP discusses the inextricable link between the climate crisis and the ongoing fight against extreme poverty. Apologies for the poor sound quality and the gap at the 5:45 mark but it was a covert operation after all, which was disrupted on two occasions by event staff. Surely Gore is correct in asserting that climate change is an ethical issue and we have a moral responsibility to future generations to take action. But there are great many issues that have been framed as “moral imperatives” (think extreme poverty, nuclear disarmament, factory farming, even homelessness in Canada), for which we have made pitiful progress over the years. I am not optimistic that pitching climate change as an ethical challenge will move us closer to a solution. Still, the message of Gore’s speech is clear and his urgent and passionate call for action resonates even more strongly as we witness the continuing devastation being wreaked by natural disasters around the world. The unprecedented heat wave in Russia, the horrific flooding in Pakistan and the deadly mudslides in China can all be linked to a changing climate. They are not symptoms of things to come; they are a sign that climate change is already upon us. No, we cannot say with certainty that climate change is responsible for these disasters but more frequent catastrophic events such as these are exactly what climate scientists have been predicting as we have continued to belch CO2 into the atmosphere year after year. Gore’s speech was recorded a few months ago but it now seems particularly prescient given the tragedies unfolding in recent weeks. [If you’re short on time, listen to his comments at the 8:15 mark and beyond.] Will these disasters finally signify the tipping point that pushes us to take meaningful action? Don’t hold your breath. To download the interview to your computer and/or MP3 player, right click here and select ‘save target as’ or ‘save as’. Don’t forget all earthgauge interviews are available as podcasts on iTunes.